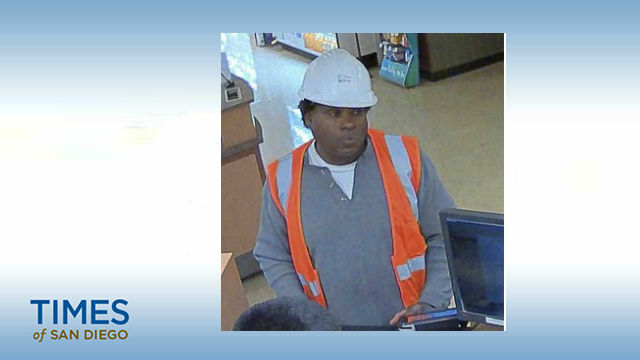 Authorities asked the public Thursday for help in identifying a man suspected of burglarizing 10 San Diego-area homes in recent months while dressed in construction worker attire. The thief was clad in a laborer’s vest and safety helmet when he broke into the homes through rear sliding-glass doors and stole cash, jewelry and high-end purses from the victims’ master bedrooms, according to police. The crime spree occurred in Mira Mesa, Poway and Rancho Bernardo between January and this month. One of the burglaries netted him 30 federal savings bonds, which were later cashed in Oceanside and Vista, police said. A surveillance camera in one of the banks where he traded in the notes captured images of him, according to authorities. Anyone with information about the case is asked to call San Diego County Crime Stoppers at (888) 580-8477 or contact the agency online at sdcrimestoppers.org. Tipsters may remain anonymous and could be eligible for a reward of up to $1,000.